Equinox prides itself on being a fitness innovator. More than just a gym, it’s the lifestyle brand for people who are laser-focused, type-A and in pursuit of perfection. With this in mind, we set out to provide members with an immersive cycling experience that tapped into their “always be better” mentality, and inspired the kind of competition and community that give boutique cycling studios their edge. As the fitness landscape evolves, companies like SoulCycle and Flywheel are taking members away from traditional gyms with a more compelling indoor cycling offering. 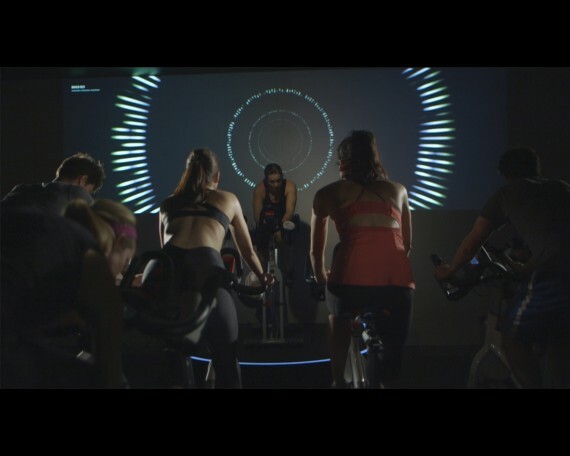 We were challenged with re-launching Equinox’s indoor cycling experience in a way that re-affirmed their reputation as innovation leaders in the fitness world. The mandates were four-fold. First, tap into gaming ideologies to update the gym’s signature ride structure. Second, empower instructors to deliver an inspiring workout by equipping them with real-time user data. Third, give riders an easy and meaningful way to measure their performance. Fourth, immerse riders in a “tribe” mentality by creating a strong digital community. We began with an existing platform, Equinox’s Schwinn bike, and rebuilt it to deliver meaningful data to riders. This data collection would need to work in any Equinox club on up to 50 devices simultaneously. To accomplish this, we took existing data—watts and RPMs—and used it to come up with games that aligned with the brand’s exercise science insights. Inspired by generative art and Google Chrome’s Web GL Experiences, we built two responsive games that visualize over 500,000 pieces of performance data with real-time, 3-dimensional graphics. At the beginning of class, each rider is assigned a circular avatar or “wheel” that gets brighter or dimmer as they speed up, slow down and generate more or less wattage. They also interact with other riders’ avatars, moving up and down the screen as the individuals compete (in speed and distance challenges) or pair up (for partner challenges). The goal was to look at this data visualization like a tech-influenced art piece, and give riders the ability to control that art piece. The result is a first-of-its-kind responsive dialogue between riders and the room. While a number of cycling studios are collecting and sharing user data, no studio has projected this information in a visually stunning way. In each class, members are motivated by their real-time performance on a large screen display. They’re served up ride details on their iPhone using second screen technology, which we created to replace the Schwinn bike’s limited console. Simultaneously, instructors receive class data on their own digital console, allowing them to effectively coach the room. The result? A full-circle of connectivity. The main screen informs the instructor’s screen, individual screens inform riders, and riders inform the main screen by impacting visuals with their performance.